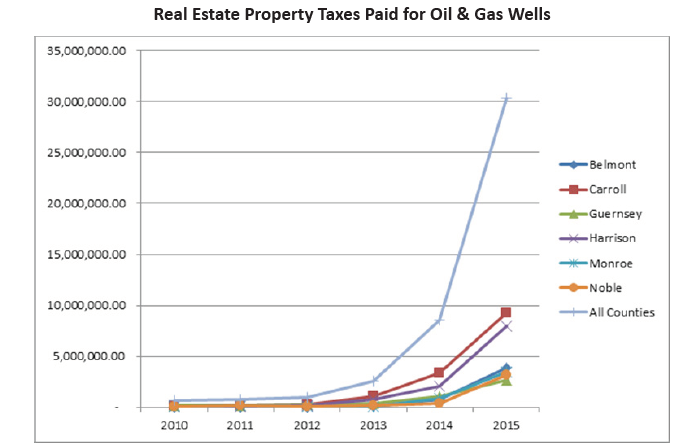 Ohio’s top six Utica Shale counties collected more than $43.7 million in real estate property taxes on production from 2010-2015, according to a new report by Energy In Depth and the Ohio Oil and Gas Association. The report entitled “The Utica Shale Local Support Series: Ohio’s Oil and Gas Industry Property Tax Payments,” consults ad valorem tax collection data from six Utica Shale mineral producing counties from 2010-2015 to examine the impact made from the first three years of Utica Shale production in these six counties. The report includes breakout statistics for each county as well, including Belmont, Carroll, Guernsey, Harrison, Monroe and Noble. The report helps to quantify taxes to be paid over the next 10 years, based on payments already received to six counties from the first three years of Utica Shale production (taxes collected in the latest year available, 2015, reflect 2013 production). Using the Freedom of Information Act, we were able to obtain the data from these six counties on real estate property taxes collected, as well as the breakout of real estate property taxes paid specifically from wells or ad valorem taxes. Considering Utica Shale oil production has increased by 496 percent and natural gas production has increased by 852 percent since 2013, it is reasonable to conservatively project Ohio Utica Shale counties will reasonably receive an additional $200-$250 million boost from real estate property taxes on wells over the course of 10 years (2016-2026). Of course this is only one tax the oil and natural gas industry pays in Ohio. As EID has previously reported, sales tax revenues have skyrocketed by 65 percent in these same counties over the past five year as well. Real estate taxes paid on wells accounted for, on average, 22 percent of the total real estate property taxes paid in 2015 to these counties. NOTE: We are embedding all of these files in this post. Just click on read more to view them. How Do Drillers Manage Fluids From Fracking? Has U.S. Oil and Gas Industry Turned the Corner?